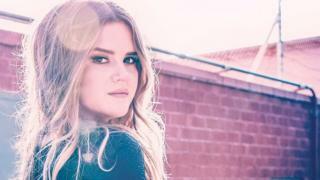 Image caption Maren Morris: "The last 12 months feels like 10 years"
This time last year, Maren Morris was a relative unknown, playing a side stage at London's Country 2 Country festival. Then something unexpected happened. "My single My Church hadn't been out for very long," she recalls. "But the crowd already knew all the words. "That was the first documented 'wow' moment for me, hearing that whole crowd sing it back to me." Fast forward 12 months and Morris is one of country music's biggest new stars. She was named best new artist at the Country Music Awards, won best country song at the Grammys, played on Saturday Night Live and staged her first ever tour. "Everything took off a little bit faster than we had imagined," she marvels. "It's been turbo-speed." This weekend, the 26-year-old returns to Country 2 Country - this time on the main stage. As she warms up for the show, she tells the BBC about the last 12, dizzying months; having a day named in her honour; and how she was trained for success at something called "Grammy Camp". As a teenager, you failed auditions for The Voice and American Idol - but now contestants are singing your songs on those shows. Do you feel vindicated? Oh yeah, it's very gratifying! It means someone loves my song enough to work it up for their audition. That's very cool. But I'm honestly so thankful that I didn't make it onto any of those shows. There's just so many of them now. I think The Voice is on season 40 already. And now you have a Grammy! What do you remember of that night? Oh, it's still weird. I'm still reeling. It just felt like such a triumph because it was my first try - my first album on a major label. No-one can describe it, your first Grammy. It's something you practice in the mirror when you're seven years old but when you get to that day, there's so many emotions, so many people around you. It's hard to articulate but it's just the most amazing feeling. You won for My Church, which is about music being a sanctuary. Yeah, I've always been inspired by music and healed by it. It seemed natural to write a song about my love for it. Do you remember the moment you came up with it? Yeah - I was at a weird emotional crossroads. I'd had a little luck in the songwriting world [Morris wrote songs for Kelly Clarkson and Tim McGraw] but I wasn't getting my songs on the radio, so I went on this writing trip to LA and wrote my heart out. Then I was driving around one day, and I remember being really struck by seeing the ocean. A song came on the radio - and I don't remember which one - but I thought to myself, "this really is a church to me". It's amazing how a song, even just a couple of seconds of a song, can change your mood. So I wrote the title down, My Church, and brought it to my co-writer Busbee the next day. Image caption "The Grammys were the most magical night"
What's it like the first time you hear your own song on the radio? It's monumental! You're just driving around and it randomly comes on. You can't prepare for it, and I certainly wasn't ready. I was driving around Nashville and it was snowing, then I heard the first few chords and had to pull over, because I was so overcome with emotion. It's kind of ironic that I had to pull over when the song is about driving and listening to music! You once attended Grammy Camp. What was that? It was 2005 and the Grammy Foundation flew high school kids from across the country to LA for a week for all these seminars. It was really cool - we got to work with top writers and listen to people like Jimmy Jam [producer for Janet and Michael Jackson] and David Foster [Madonna, Michael Buble] talk about their career. It was just like Disney World for a music freak. So will you go back to give your own masterclass now that you're a fully-fledged Grammy winner? Any time they ask, I'll be up for it because it left such a big impression on me. For the first time, I was surrounded by kids my age that were interested in the same things I was. That's why I'm so passionate about music education, especially in public schools. What do you think about the likely cuts to arts education in the US? It's very sad. I went to a pretty run-down high school and there was no funding for arts - so now I give all the proceeds from the "meet and greet" tickets on my tour to my high school fine arts programme. My job now is just to give back to things I'm interested in, and that's a big one. Your album paints a vivid picture of a woman in her early 20s, with all the good and bad things that entails. Who are your inspirations, lyrically-speaking? I look up to a lot of female songwriters. I love Dolly Parton, I love Patty Griffin and I've always loved Merle Haggard and Johnny Cash and Elton John. They're all storytellers. That's why I grew up loving country. It's all so honest and story-based and the lyrics are poetic, but they're structured so well. It's really airtight writing but I love it in a soulful way, too, because it's such a truth-telling genre. Speaking of truth-telling, Drunk Girls Don't Cry is a song where you tell a friend to dump her lover. Did she take your advice? She did! That one didn't last very long. I won't take credit and say it's because of my song, but I would like to think I sometimes have good advice to give. Did the song mirror a real-life conversation? Not in those exact terms, but I remember having a glass of wine with my friend and hearing her go on and on about the guy for the thousandth time. I was like, "Come on, you're way too good for this guy." The next day, I was telling my co-writers about the whole thing. I wasn't aiming for a song, I was just complaining - but Luke Laird just started playing that chord progression and singing the hook. Why did you call your album Hero? It's from a song called I Wish I Was, which I wrote when I went through this very major break-up. I was the breaker in that relationship, so the lyric is "I'm not the hero in this story". But a lot of things changed from the day I wrote that song. I got through the break-up, grew up, stopped being so selfish and became more aware of people's feelings. And I think, in a way, I became the good guy over the course of those years. So I thought it would be cool to take a word from a song where I'm the villain and say that, over the course of making this album, I sort of became my own hero, in a roundabout way. I noticed that 27 December was Maren Morris Day in Arlington, Texas. Is that set in stone forever? I guess?! That was hilarious. It happened at my parents' hair salon - the mayor came and he handed me this plaque. But one of my best friends has her birthday on 27 December. I was like, "Sorry, Skylar, it's Maren Morris day. Your birthday can wait 'til tomorrow." Maybe you could declare the 28th her official birthday, like the Queen. Totally. I can do that. I think I have that power now.